As each year draws to a close, it’s traditional to take stock of where we’ve been, and look forward with hope to the year to come. This year, climate-related news has been stark and sobering, with the latest IPCC report giving the world 12 years to take significant action, and the National Climate Assessment projecting grave climate impacts virtually everywhere. Given this reality, what does it mean to look forward with hope? Here at Climate Smart Missoula, it’s part of our mission to shine a light on climate action in our community. One way we do this is with one of our favorite year-end activities: our annual Smarty Pants Awards. Our Doctorate of Dedication award this year went to Ben Schmidt. Ben is stepping down after two decades of service as the chair of the City’s Energy and Climate Team! In this role, Ben helped coordinate the very first City greenhouse gas inventory back in the 1990s, and he jump started conversations about climate change and energy before it was cool. Among other things, the ECT also supported the creation of the City’s Conservation and Climate Action Plan. Ben also designates the proceeds from the annual Pumpkin Run, which he coordinates, to fund solar and clean energy projects. Ben’s abiding dedication to climate issues is why he’s the perfect candidate for this award. Ben may be stepping down as ECT chair, but we know he will continue to move these issues forward in his characteristically humble yet persistent way. Phear, who will soon be moving on from her decade-long tenure as Director of the Climate Change Studies program at the University of Montana. Nicky truly embodies the title of this award. 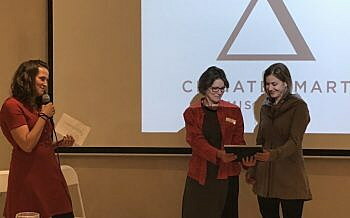 Under her visionary leadership, the CCS program has become an integral part of the larger Missoula community, offering students invaluable opportunities for internships and connections with local organizations and nonprofits. 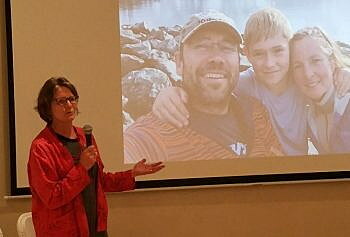 Nicky was a member of the original Mayor’s Advisory Team that helped the City initiate formal climate change planning efforts, and she was a key member of the Adapt group that hosted community summits over several years, the outgrowth of which is Climate Smart Missoula. Although Nicky has decided to move on from her position at UM, community building is in her bones, and we’re excited to see where she applies her talent and passions next. 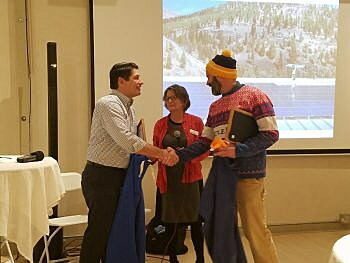 This year’s wild card award honored the team efforts of Missoula Electric Co-op and KettleHouse Brewing Co. for their community solar project atop the new KettleHouse taproom in Bonner. This ingenious partnership is well-deserving of the Partners for Renewable Energy Possibilities (PREP) award. Not only is it a great example of community solar collaboration, enabling MEC members to buy into the shared solar system and reap the benefits of renewable energy, but anyone who buys a panel gets a free beer whenever they want one – a good deal all around. Thanks to Mark Hayden, General Manager of MEC, and Tim O’Leary, KettleHouse owner, for joining forces, and we hope this project inspires more creative clean energy partnerships across our community. Amy Cilimburg describes the lasting impact and inspiration of Tom Platt, the “2018 Catalyst for Change” award winner. was also the brain behind the innovative poplar farm adjacent to the municipal wastewater treatment plant, which grows sustainable timber while keeping our river clean. As with so many things he did, Tom was “all in” on these projects, and his work is an incredible legacy and gift to our community. We were grateful to be able to give Tom his award earlier this summer. 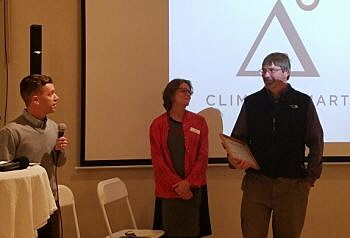 Climate Smart Missoula formally launched in 2015, but the process that got us going began long before that, and involved the input and hard work of many Missoulians. Our Smarty Pants Awards keep us connected to our roots, and are a reminder that when we look for it, action on climate change is everywhere. Together, let’s keep shining a light, moving forward in hope, ready to seize every opportunity for action in the New Year. Abby Huseth is the Energy Program Coordinator at Climate Smart Missoula. This Sustainable Missoula column is brought to you – via the Missoula Current – every Friday by Climate Smart Missoula and Home ReSource. Happy Holidays All and we’ll be back in 2019. January 10 — Climate Smart Missoula’s Monthly Meetup on Renewable Energy and 100% Clean Electricity. 5-7 pm at Imagine Nation Brewing Co, 1151 W. Broadway.